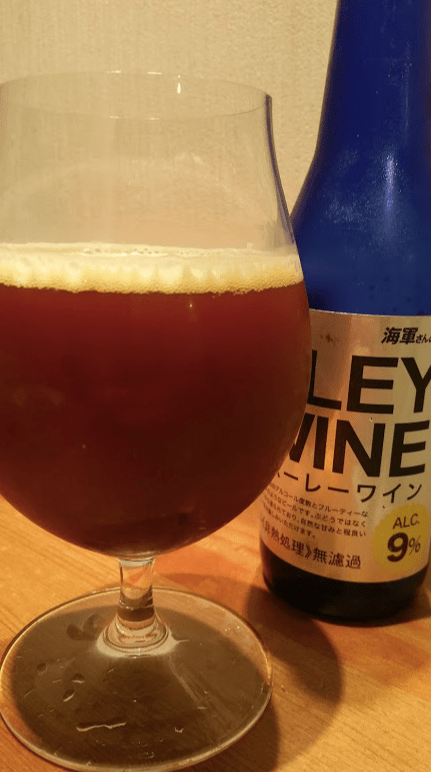 Kure Barley Wine is a 9% barleywine from Kure Beer, based in Hiroshima, Japan. It’s part of their seasonal lineup of craft beer and can be found on sale from mid-December onwards. It’s brewed with six different kinds of malt in the mash, though the specific malts are not listed on the Kure Beer website or elsewhere, though it does have an IBU of 54. At the time of writing, Kure Barley Wine can be found in both bottles and on tap across Japan. Kure Barley Wine poured out a deep copper red colour with a more head than usual for a barleywine, that was tinged with red flecks on top. It had a potent sweet caramel aroma though it was not as offensive or as olfactory destroying as other barleywines I’ve had. It reminded me of maple syrup, caramel, and a tad bit of rich dark fruits. At 9%, Kure Barley Wine is also one of the “weakest” barleywines I’ve had too, with many others clocking in at 1o% or even up to 15%, but these beers are not about getting wasted on quickly. As usual, I split Kure Barley Wine into three portions, and the first one, being chilled straight out of the bottle, was smooth and syrupy – nice but lacked any real depth of flavour. The sweetness was balanced, though it felt like it wanted to let go and develop more. The second portion, having slightly warmed up for about 10 mins, was perhaps the best of the bunch – smooth, silky, and sweet with lashings of caramel, rich fruits, and a creamy mouthfeel. However, when the third and final portion had warmed up to room temperature, there was a definite alcohol burn to the beer and as such, felt unduly harsh. Kure Barley Wine isn’t going to blow your mind, but it is a reassuringly well-made barley wine when slightly warmed up.